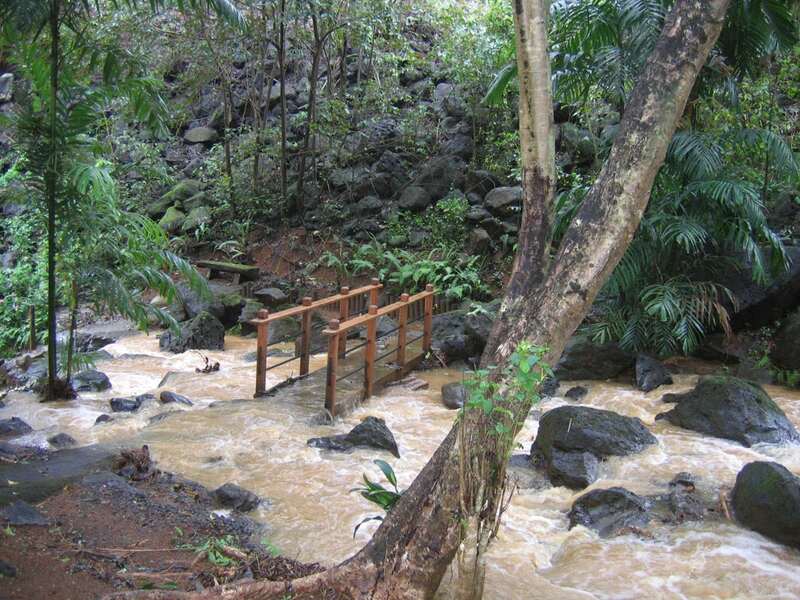 Na ‘Ᾱina Kai Botanical Gardens and Sculpture Park, located on the island of Kaua‘i, has blossomed into one of the most celebrated outdoor experiences in the country. Opened to the public in 2000, it began more simply in the late 70’s with a few seeds planted in paradise by a couple in “retirement.” This is the story of how one small garden grew step-by-step into a national treasure. 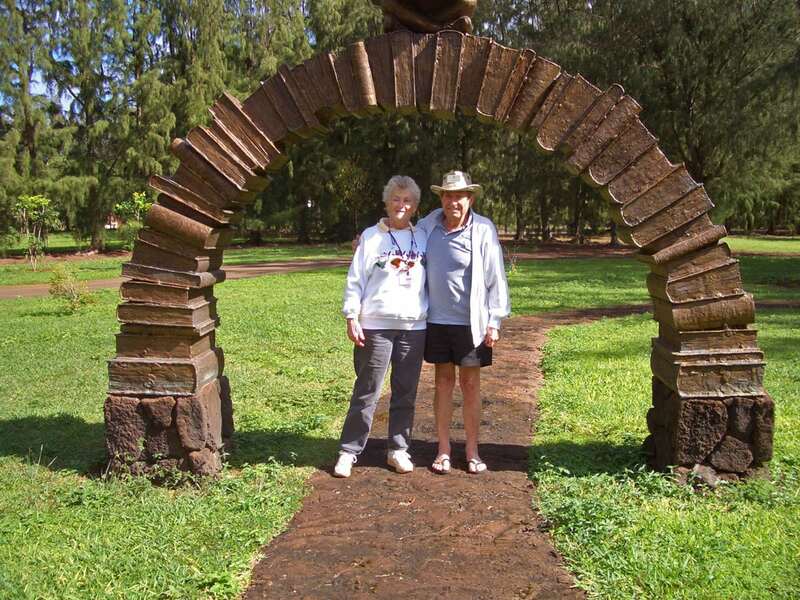 Founders Joyce and Ed Doty visited Kaua‘i for many years before choosing Kilauea, on the island’s north shore, for their retirement. 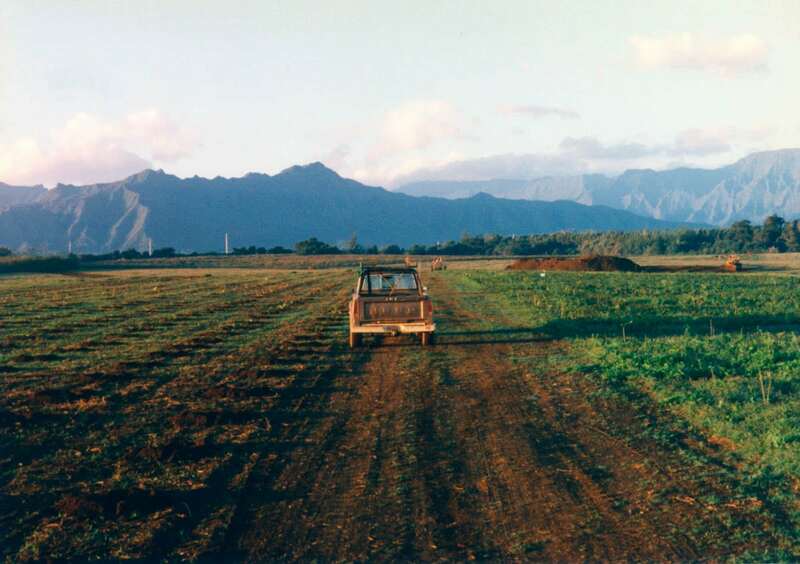 In 1979, they bought the first of many lots which would eventually form Na ‘Ᾱina Kai. When Joyce and Ed moved into their completed residence in July, 1982, their pioneer spirit became immediately evident: when the subdivision owners did not initially supply power, they lived without electricity for six weeks. 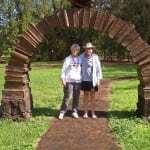 At first, Joyce and Ed had planned to be “snowbirds,” living part of the year on Kaua‘i and part of the year on their long-established ranch in northern California. As they devoted more and more time and attention to their island home, they began to realize that it was not in their nature to leave a place unattended. When hurricane Iwa hit Kaua‘i on November 22, 1982, they found themselves once again living without electricity. That did it—they knew they were on Kaua‘i to stay. The original twelve-acre house lot, now beautifully landscaped with numerous garden settings, was once flat pastureland. Initially, the Dotys’ residence was surrounded by a horticultural wasteland. Joyce’s creative mind began churning with design ideas. One idea led to another as she and Ed dove hands-on into red dirt. Before they knew it, they were knee-deep in the largest landscaping project even they never imagined! 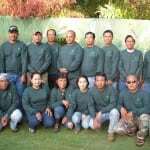 Discovering it was difficult to obtain mature landscape trees, they quickly began learning how to cultivate tropical plants, starting a collection of their own from seeds and cuttings. 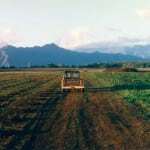 With great care, Ed prepared the land for planting. Soon, row upon row of ornamental trees sprang up in their yard. In front of their eyes, a garden was born. Home projects expanded as they planned a natural-style swimming pool and hillside garden, both with elaborate water features. Joyce collaborated with John Groark & Associates for the design of the swimming pool and the hillside pool, stream, and cascade. A steep path led to the beach below their home. 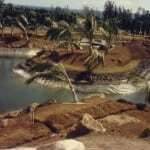 A few years later, soon after completion of the pool project, during the 1991 Anahola flood, a large portion of the hillside broke away and slid down the bluff—severing beach access forever. 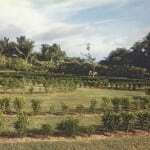 The Dotys’ garden continued to grow when Joyce designed the Poinciana Maze in 1987. She had always wanted a maze. Rather than a puzzle maze, she envisioned a more predictable picture maze where one could wander without getting very lost. A landscape architect taught Joyce a key idea in her planning: an ideal garden does not reveal itself entirely at first glance. Rather, it should incorporate “surprises” for the visitor, which lie around each corner. Inspired by this idea, she sketched a large flowering plant with a straight stem and symmetrical “dead-end” branches on either side. The “flower” would be a Poinciana tree, which she had started from seed. As it matured, its bright red flowers would cap the top of the maze in the summer. Using Joyce’s sketch as a guide, Ed laid out the maze pattern on their level lawn. Joyce started from seed the first 900 mock orange plants used for the hedge, purchasing another 1,500 plants from local nurseries. Then, she placed a mix of visual treats throughout the maze for visitors to discover as they explored its many branches. 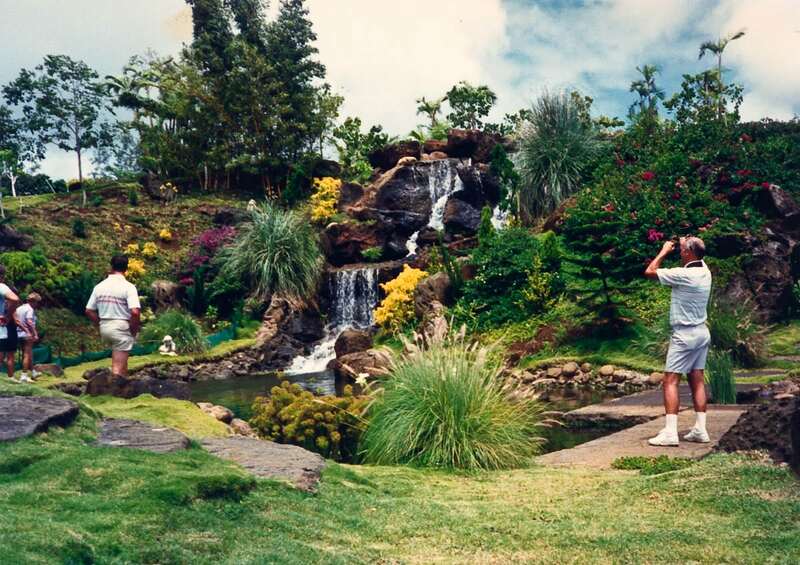 In 1988, soon after planting all the shrubs for the maze, the energetic couple was ready to begin another extensive project—Ka‘ula Lagoon. 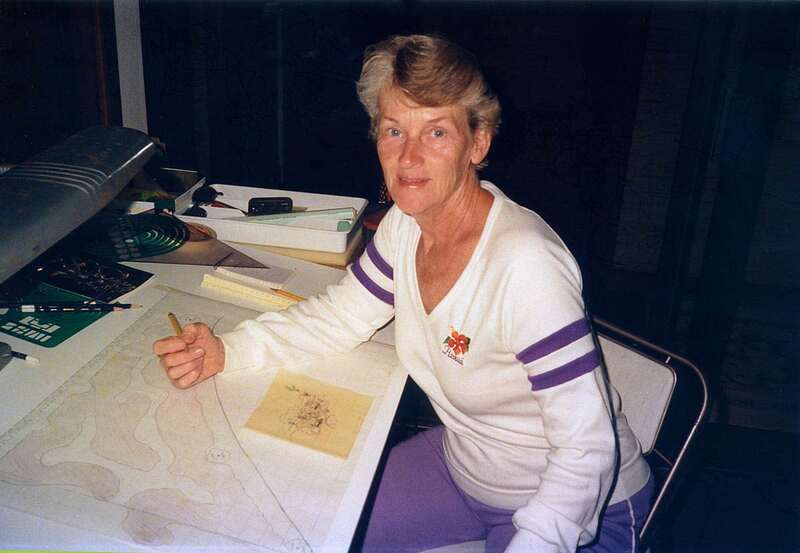 For this, Joyce drew on another valuable tip from the landscape architect: “Every garden that’s worth its salt has to have water features.” Once again, Joyce sat down at her drawing board where she sketched her vision for an extensive lagoon surrounded by gardens. In addition, she created a clay model, which allowed her to test the proportions until they were just right. By now, the tropical trees planted from seed were fully grown, with one small problem—they were occupying the space slated for the lagoon. Ed flat out refused to move the trees to another location in the garden. Fortuitously, the Kaua‘i Westin (currently, the Kaua‘i Marriott) was then developing its Kalapaki Beach resort and needed mature tropical plants. 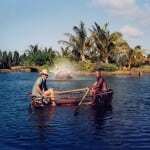 Their purchase of most of the trees freed up valuable space so that construction of the lagoon could begin. Ed, a professional contractor and “the mathematical one,” made a grid on the lawn, outlining the lagoon with white sand to clearly show where the water would be. Kobayashi Trucking Company arrived to begin digging out the lagoon, piling the dirt to form the surrounding hills. 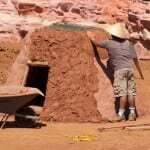 The Dotys once again hired John Groark and his team to help design the water features. Horticulturist Richard Beach, who had helped landscape the swimming pool, returned to bring Joyce’s vision for the plantings to life. They commissioned artist Pancho Vining to create the fountain sculpture “Flight of the Tropic Birds”—a focal point of the lagoon. 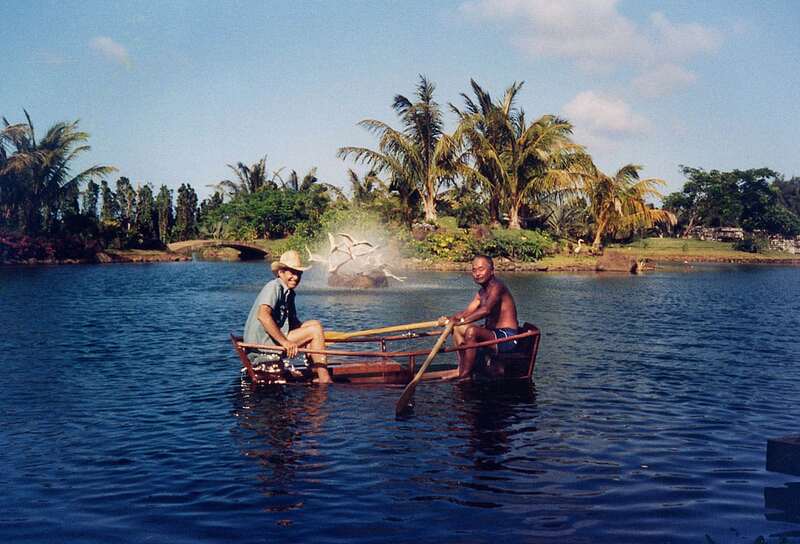 During the three years it took to build Ka‘ula Lagoon, Ed took a very active role in the design and construction of improvements at the garden, including the Japanese-style teahouse, which overlooks the lagoon waterfall. The next addition to the garden began in 1991 with Joyce’s development of the International Desert Garden. As a young woman, Joyce had lived briefly in New Mexico, long enough to become enchanted with Southwest’s dry wash. Now she wanted to enhance her tropical garden by showcasing cactus and succulents. In her tried and true style of design, she first sketched her ideas for a miniature desert area before making a clay model of her vision. 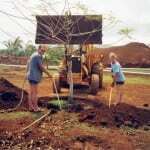 The Dotys had purchased parcels adjacent to their property for growing tropical fruit trees. Ed used the soil from these lots to build the mounds, which had been specifically designed for excellent drainage and windless heat. 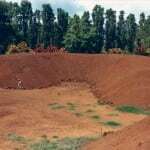 The mounds do not allow wind to flow freely, thereby retaining the heat. Joyce, Ed, and horticulturist Richard Beach procured an extensive collection of plants from a Southern California nursery to plant on the mounds using Joyce’s designs. 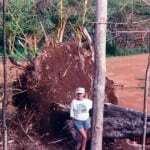 On September 11, 1992, the normal course of life for island residents temporarily halted as Iniki, a Category 4 hurricane, blew over Kaua‘i. Hurricane Iniki (meaning “strong and piercing wind” in Hawaiian) was the most powerful hurricane to hit the Hawaiian Islands in recorded history. At Na ‘Ᾱina Kai, extensive destruction from the storm was evident: bent and broken trees, denuded foliage, and salt-poisoned plants lay everywhere. Fortunately, the buildings on the property were not badly damaged. Joyce and Ed began working right away to restore their garden to its picturesque condition, their enduring spirit intact. 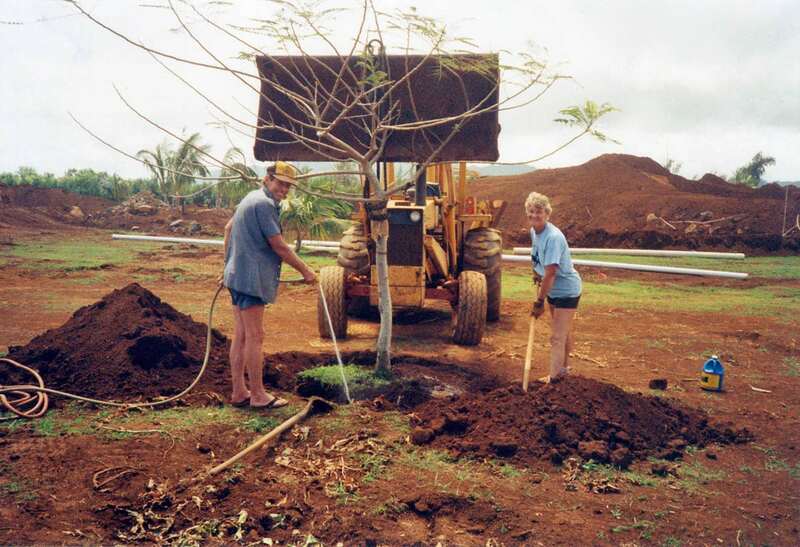 While continuing landscaping projects for their home, the Dotys had also been farming. 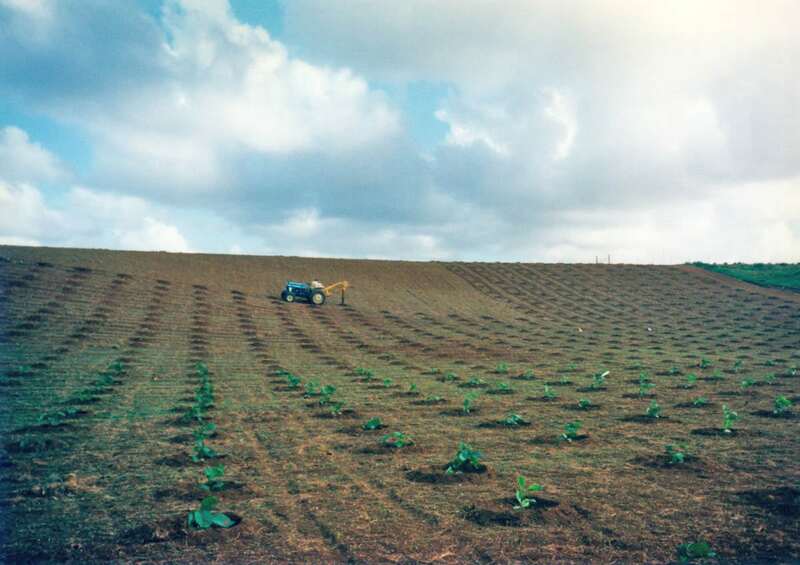 On an additional parcel they purchased in 1979, they created a partnership for growing vegetables and tropical fruits, called Kilohana Farms, with Kilauea farmers Mike and Candace Strong. 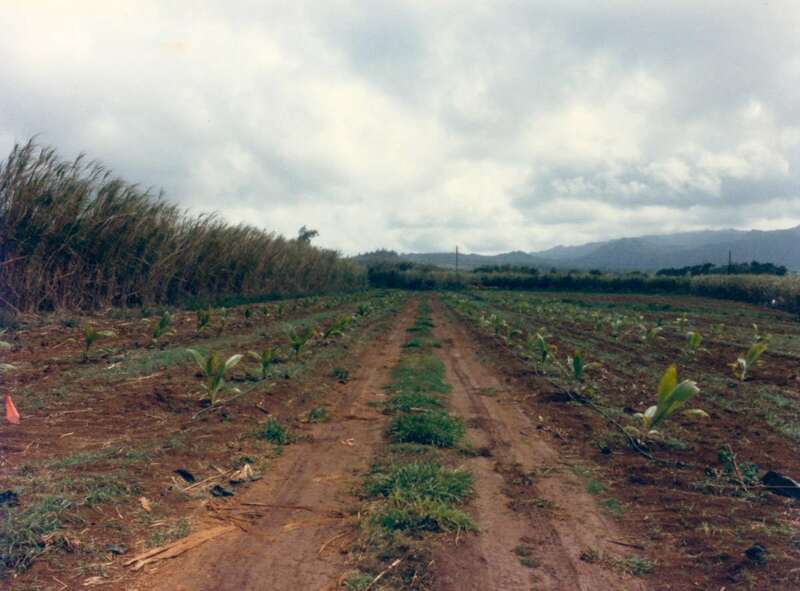 After Hurricane Iniki in 1992, they decided to lease Kilohana Farms to the Strongs rather than be involved in the day-to-day process of raising exotic fruit trees. The land has since been used for new design areas. Joyce felt it was key to incorporate hardwood trees into the garden. 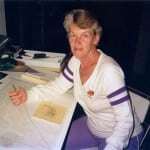 She had collected teak seeds on the Big Island from their 80-acre agricultural property that they had purchased in the early 1980’s. 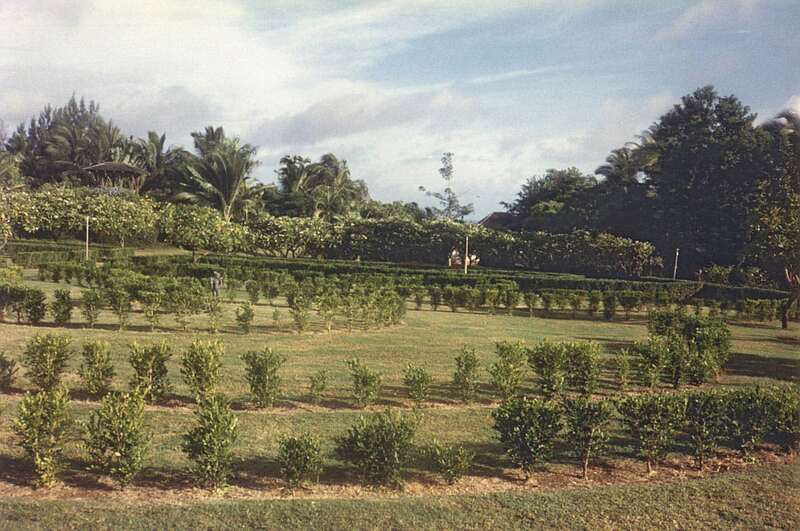 They had been told that teak could not be grown on Kaua‘i. Joyce had other ideas. “Fortunately, a neighbor called, telling me about an old seed catalog which described how to germinate teak seed. You soaked them for 24 hours, then dried them for 48 hours—repeating that FIVE times before putting them into potting soil. It worked! Seventeen days after putting them in potting soil, they began to germinate,” Joyce explained. 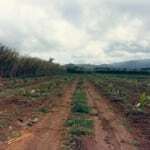 The Strongs had abandoned former lychee groves after the hurricane. 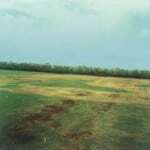 In 1993, the Dotys used these groves to plant the first teak trees. 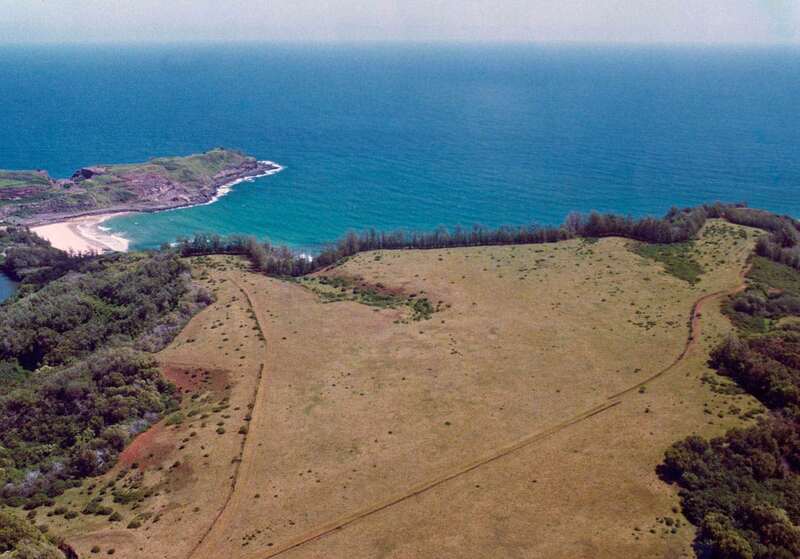 The Dotys purchased a large plantation lot, which also included the Kuliha‘ili Canyon and beach area, in 1995. 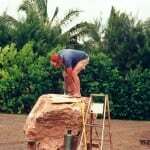 That same year, they hired garden horticulturist, Marty Fernandes, who immediately became an important part of the Na ‘Ᾱina Kai team. Her husband, Chris, soon joined the staff as the garden mechanic and general fix-it man. 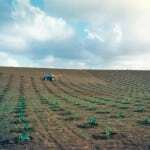 Over the next four-year period, the Dotys and their staff planted approximately 60,000 hardwood trees on the Kilauea land. In the future, these hardwoods will be harvested in order to provide funding for the garden. 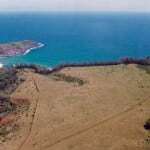 Per the Dotys’ wishes, neither forest on Kaua‘i nor the Big Island will ever be clear cut. 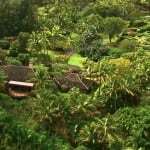 Because local people were increasingly curious about the developing property, Joyce and Ed began giving a few tours in 1991, starting with the Mokihana Club of Kaua‘i. It had always been the Dotys’ intention to form a trust, which would open the garden to the public after their deaths. But when Ed saw the delight on Joyce’s face while she conducted these private tours, he thought, “Why wait?” By opening publicly while they were still living, they could share their creation with a larger community, while actively being involved in the garden’s development. In 1997, in preparation for the garden’s future opening, the Dotys converted a portion of the original equipment shed into the Visitor Center. The new space was an ideal site for an orchid garden where visitors could gather before their tour. Joyce purchased orchids from local growers, and now many varieties prosper in the collection. By the close of 1999, the Dotys were ready to go public. 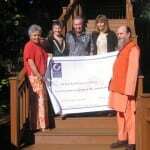 They donated all their acreage, buildings (including their residence), and sculptures to a newly formed not-for-profit foundation, named after their garden. 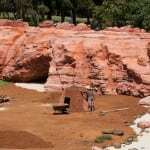 Na ‘Ᾱina Kai (“Lands by the Sea”) Botanical Gardens and Sculpture Park (the “Garden”) soon opened its doors to the community. The year 2000 brought a new focus to the Garden. Many volunteers emerged to help lead the numerous tours. The role of horticulturist Marty Fernandes continued evolving. She wrote the Tour Leader Manual and trained new volunteers. Over 150 island residents have participated in these programs. Currently, 50 to 75 people are on call to assist Na ‘Ᾱina Kai’s staff. Soon after the Garden opened, the Dotys decided to make their ocean bluff house available for a variety of garden functions. On additional plantation lots, purchased across the highway from the Garden, the Dotys built another home for their use, remodeling their former home, called “The Residence,” as a site for private gatherings. As the Garden flourished, and more and more visitors arrived, Joyce saw the need to create a specific area for children. Rather than forming a day-care center, Joyce designed a special garden area that would be part of a family tour. 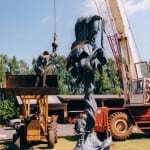 She commissioned sculptor Gary Alsum to create the 16-foot tall bronze sculpture Jack and Company, the focal point of the children’s wading pool and garden area. Multi-Media Artist Alex Gupton created the mosaic at the base of the fountain, depicting the fairytale Jack and the Beanstalk. Gupton also laid the mosaic tilework at the entry gate and along the graffiti wall. Joyce continued playful themes in the Children’s Garden with a child-height maze designed in the shape of a gecko. Inspired by a railroad train that her children had once played on, Joyce included a more detailed version in this area. Planting a young rubber tree with ample space to grow, she incorporated a treehouse in the style of The Swiss Family Robinson around it. 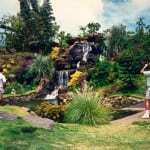 She added a tropical jungle and hillside with tunnels and slides, as well as log cabins built from Garden teak trees which had been thinned in 2002. 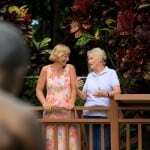 Featuring bronze sculptures with a whimsical theme, Under the Rainbow Children’s Garden opened for tours in 2005, proving to be another favorite garden area at Na ‘Ᾱina Kai. In September, 2006, Na ‘Ᾱina Kai received a fortunate gift for their children’s area when former sugarcane plantation employee and Kilauea neighbor, Nicholas Rapozo, generously donated the bell from the last sugarcane train at Kilauea Sugar Company. Next, Joyce focused her attention on designing a unique space, one that would reflect the islands’ heritage. With cultural education in mind, she wanted to portray an ancient Hawaiian village by depicting a miniature ahupua‘a—a Hawaiian land division, which runs from the mountains to the sea. 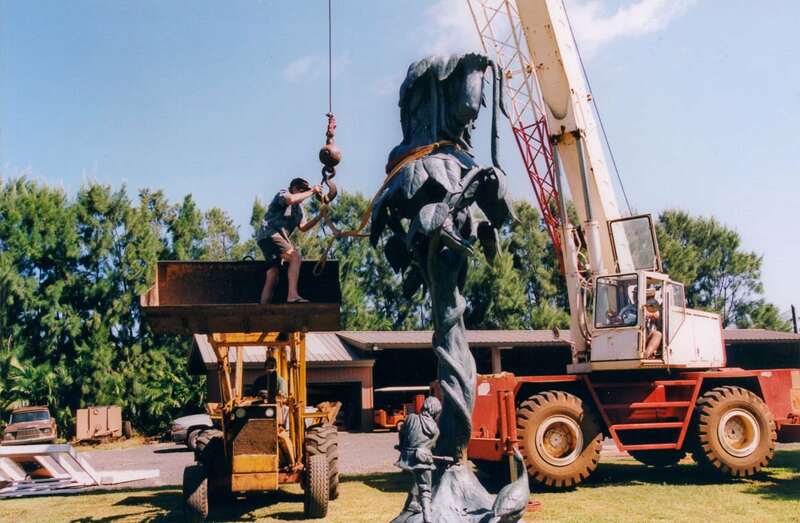 Joyce commissioned Big Island sculptor Holly Young to create the ‘ohana (“family”), representing two brothers—each with their wife, children, and grandchildren. Young used real people as models. It was important to her that the portrayal in bronze of village residents be as authentic as possible. To enhance the story of the Ahupua‘a, Joyce again chose artist Alex Gupton to create a tile mural, this one depicting the life of early Hawaiian people. 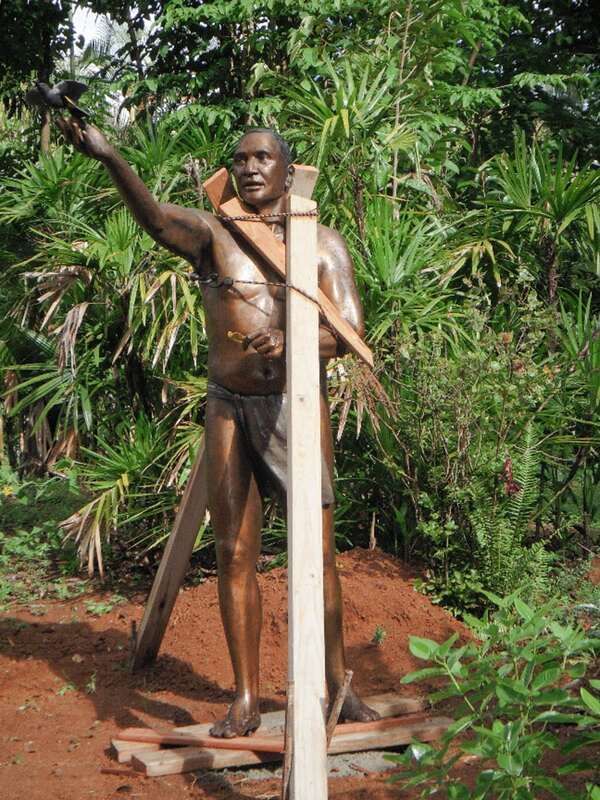 In order to create the Ahupua‘a, the construction team cleared a quarter-acre parcel on the area adjoining the Children’s Garden and The Bog House. 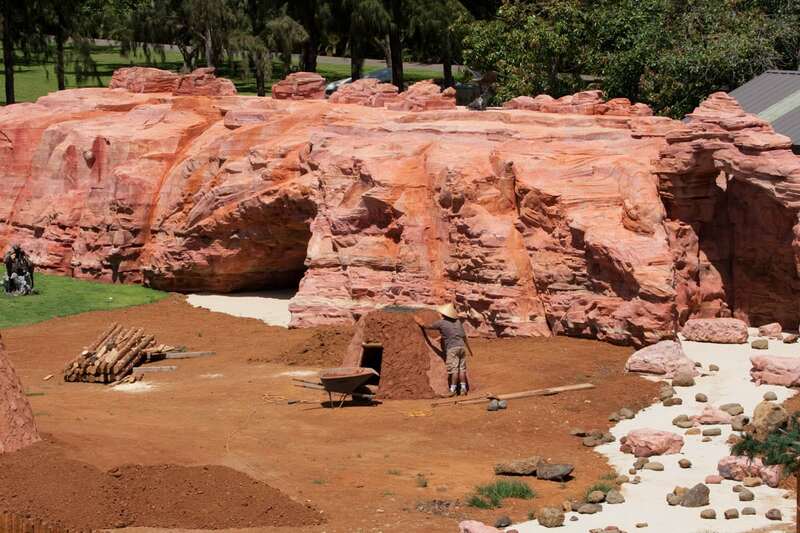 Then, using Kauai’s red dirt and a combination of artificial and real boulders, the team formed a gently sloping mountainside, creating a waterfall and stream. They added native Hawaiian and Polynesian-introduced plants for authenticity. Big Island Multi-Media Artist Layne Luna created an “ocean” with native fish. 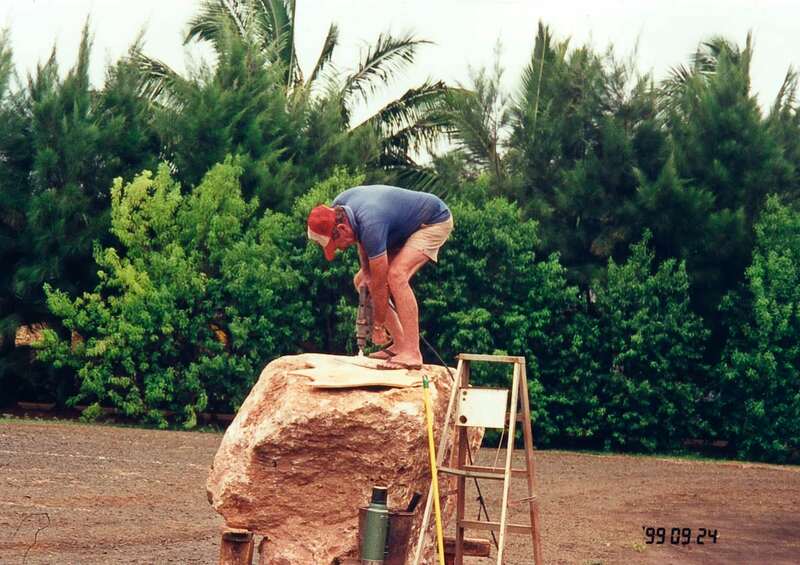 Na ‘Ᾱina Kai’s contractor, Phil Dow Construction, built the many hale (“houses”) and surrounding structures. After much research, creative imagination, and hands in the red dirt, a miniature Ahupua‘a joined the Garden’s displays. 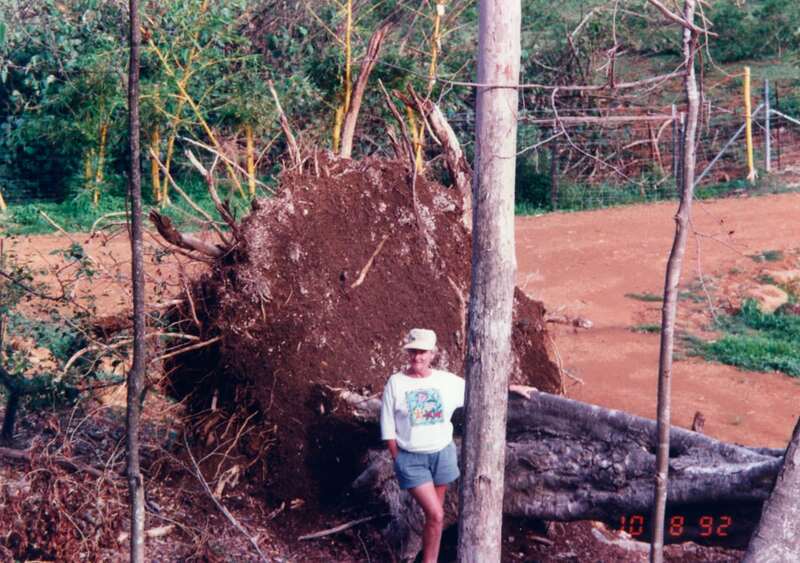 Torrential rainstorms hit Kaua‘i in early 2006. 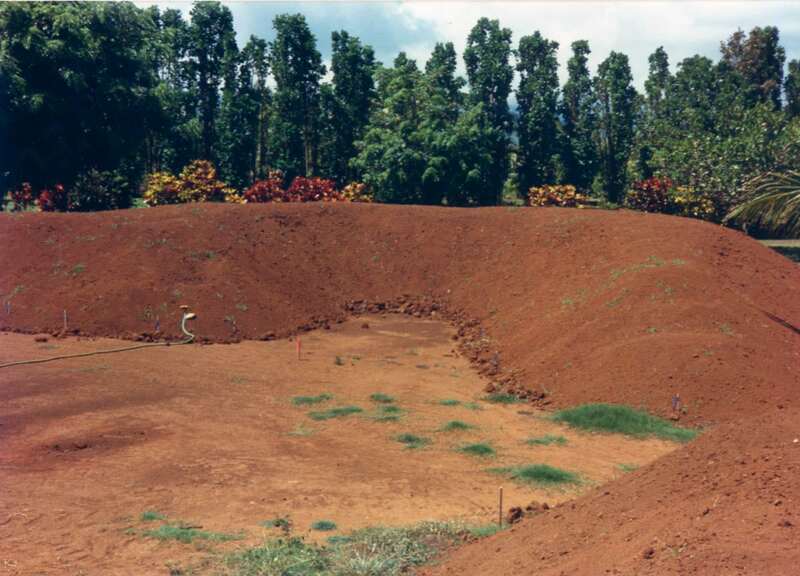 During one deluge in March, the Morita Reservoir across the highway from the Garden was destroyed, causing Na ‘Ᾱina Kai to lose their agricultural water. It took over seventeen months to obtain necessary permits and to install a well—crucial for supplying the Garden with irrigation water in the most cost-efficient manner. Since the early 1980’s, the Garden had subcontracted its industrious grounds keepers from a separate company. Through the years these hard-working and committed individuals had continued to play a significant role in maintaining and improving the ever-expanding grounds. 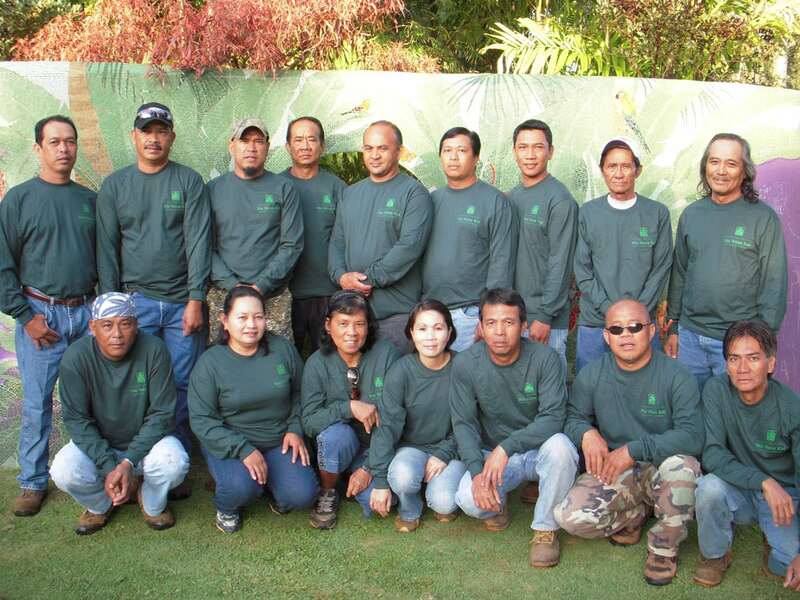 In the summer of 2009, Na ‘Ᾱina Kai’s Board of Directors decided to invite the entire crew to become permanent Na ‘Ᾱina Kai employees. They readily accepted the offer. Joyce’s playfulness was apparent as she planned the next garden area, the Horticulture Amusement Garden. “Our newest idea . . . is the Amusement Garden. No, there are no Ferris wheels or Disney-like rides. In this garden, you will find plants with strange exotic fruits, along with the normal fruits we have been growing on the farm. The difference being that they will be grouped so that you can experience ‘Breakfast’ with coffee, tea, papaya, eggfruit, scrambled egg tree, sausage tree, and breadfruit. After a snack of atemoya, you will see ‘Lunch’ exhibited with peanut butter fruit, grape jelly (jaboticaba), a pickle tree, etc.” Fun surprises for visitors pop up along the pleasant curves of the 12-foot paved pathway: Escargot and Mr. Cheesencrakers by Randy Hand for pupu; a spaghetti tree, accompanied by stone mushrooms, sausage, and olive trees for dinner; ice cream beans, cashews, and chocolate for dessert. Amusing bronze bears, called the Conspirators by Joshua Tobey, preside over this display. 2010 saw this garden area’s official opening. Joyce commissioned sculptor Susan Kliewer, who is intimately familiar with the Navajo culture, to create the village natives in bronze. 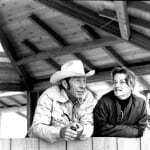 She hired artist Forrest Boone from Kentucky to form the faux rock backdrop designed to mimic the sandstone cliffs of Arizona. She decided to transfer the covered wagon, built by Phil Dow Construction using Na ‘Ᾱina Kai’s teak trees, and Ciji and Sam, Cammie Lundeen’s bronze horse and mule, from the Children’s Garden to the compound, since it suited the southwestern setting so perfectly. 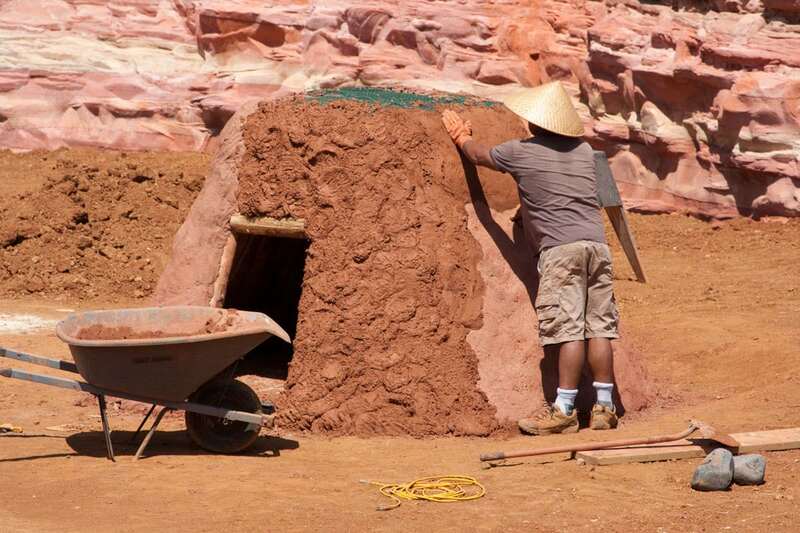 The Navajo Compound became part of the Garden’s tours in 2010. Joyce’s next project was an extension of the Ahupua‘a. “To complement Young’s work on the Ahupua‘a, we decided to take the Hawaiian historical experience a bit further. 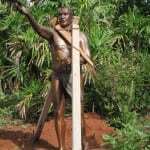 We approached her about creating sculptures that depict the practice of feather collecting from colorful birds that the Hawaiians used to create the cape for the King,” explained Joyce. Holly Young shaped five rare or extinct birds in bronze, then hand painted them to depict their beautiful and vibrant plumage. Holly also included “two Hawaiian people . . . the man collecting the feathers, and his wife sorting them in a makeshift shelter.” Phil Dow and his crew designed and built “branches and stumps in artificial material on which to fasten the various birds.” Informational placards at both entrances, by mapmaker Rob Siemers, enhance the experience for visitors. In addition, Garden horticulturist Marty Fernandes and Hawaiian plant expert Kerin Lilleeng-Rosenberger collected a wide variety of endemic plants. Joyce further explained, “As you take this short stroll through endemic and introduced foliage, you will not only meet up with the human inhabitants of this area, but will discover at each turn an explosion of color from each carefully crafted bird. Most of those species no longer exist. 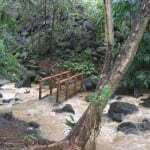 This is another opportunity for Na ‘Ᾱina Kai to combine education, art, and horticulture into a pleasing venue for our visitors.” Tours to this new area, placed mauka (“inland”) within the Wild Forest Garden, began in 2011. 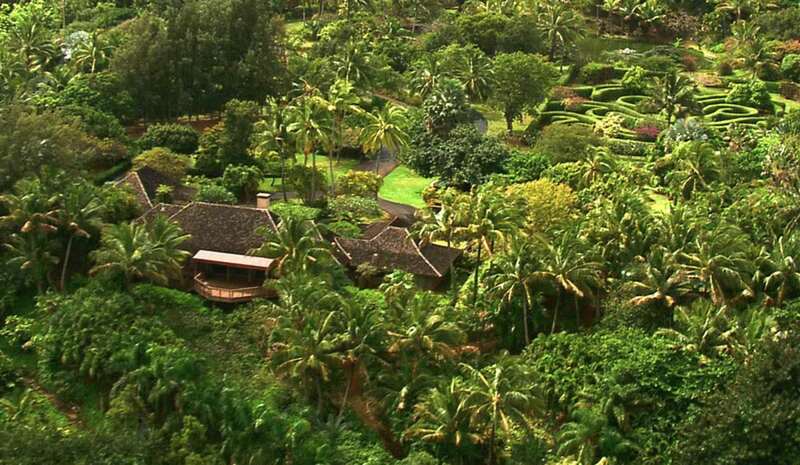 Back in 1979, as the Dotys purchased their first lot overlooking Kahili Beach in Kilauea, it appeared that yet another couple had chosen Kaua‘i for their retirement home. With each passing year, the Dotys demonstrated they were not a typical pair. 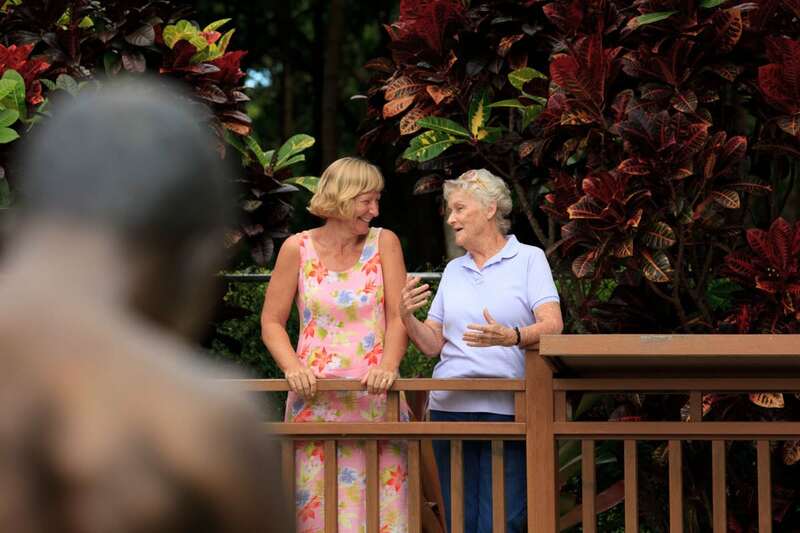 Na ‘Ᾱina Kai Botanical Gardens and Sculpture Park has grown from Joyce and Ed’s simple house lot to cover 320 acres, including over 120 life-size bronze sculptures. Joyce’s artistic vision and unstoppable creativity truly fertilized the growth of Na ‘Ᾱina Kai. 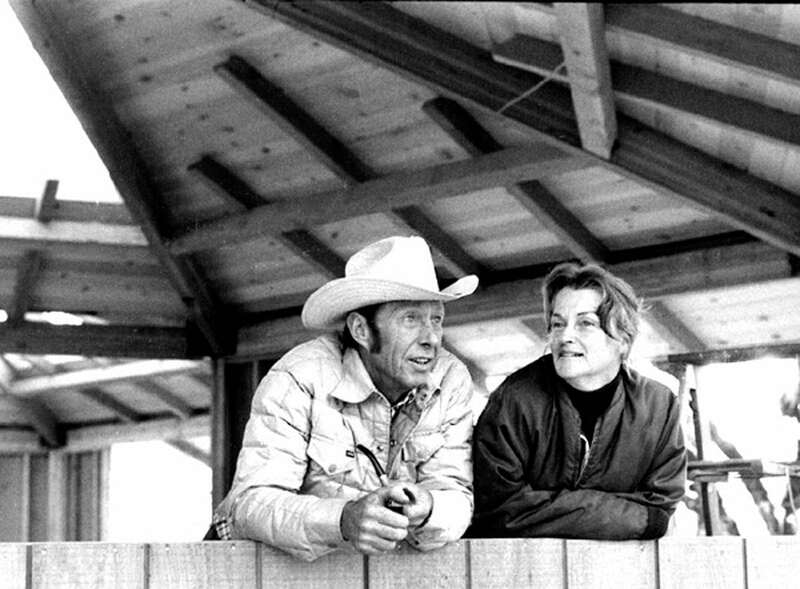 The tireless industry and commitment of this couple created a lasting legacy. 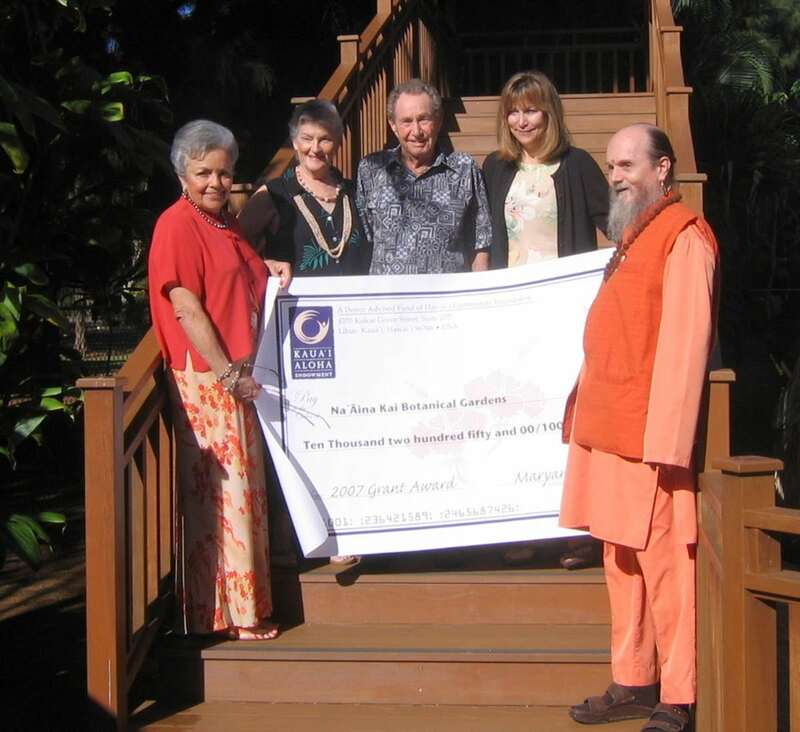 May it benefit the Kauai‘i community for generations to come.